Relatives and activists are rallying in Mexico and in the U.S. on Tuesday, still seeking answers in the case of 43 student teachers who disappeared three years ago after being taken into custody by police in Guerrero, Mexico. 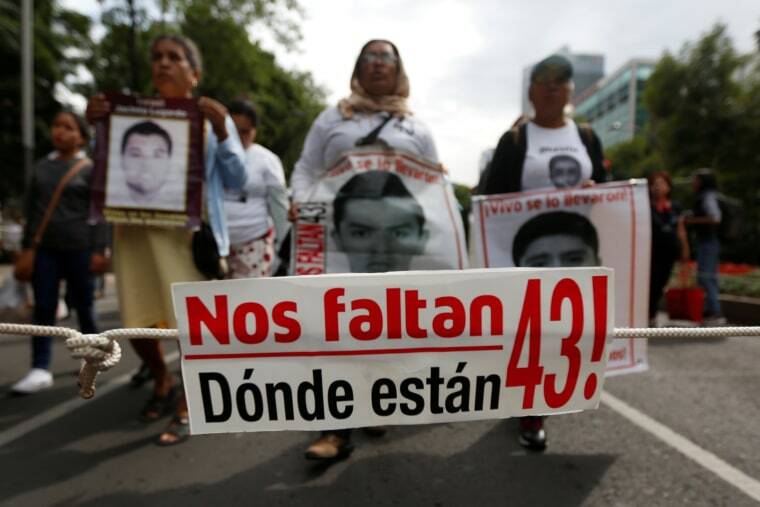 While the case has stalled, and much of the news coverage about Mexico has moved on to other important stories like the devastating earthquakes that killed hundreds in the last two weeks, the parents of the 43 students have not stopped looking for their missing sons and seeking definitive answers to what happened. In Mexico, families will march and hold a mass to remember the students as well as the victims of Mexico's earthquake. In New York, relatives and activists are marching past the United Nations, the Mexican consulate and Times Square. On the night of September 26, 2014, police with automatic weapons surrounded three buses that had been commandeered for a protest by students from the Ayotzinapa Teachers’ College. According to testimonies from survivors, the police started shooting at the unarmed students who then ran through the streets of Iguala in desperate search of shelter. By the time the gunfire was over, six people had been shot dead—the youngest was 15 years old, and 43 student teachers, among others, would eventually go missing. The Mexican government initially concluded that the students were murdered after police—ordered by Iguala Mayor José Luis Abarca—handed them over to a drug gang named Guerreros Unidos (United Warriors), which then incinerated the bodies at a garbage dump. But an international team of forensic scientists contradicted the official report with evidence showing how suspects had been tortured illegally to obtain supporting testimonies. The disappearance of the student teachers sparked massive protests in Mexico and abroad. And for Mexicans in particular, the Ayotzinapa case was a turning point, an awakening that defined un antes y un después (a before and after) which impacted their social consciousness. Even though Ayotzinapa symbolizes the breakdown or disillusionment of Mexican society, it has also empowered everyday citizens to fight for justice. And this sense of righteousness has emboldened the families and friends of the missing students to travel to the United States with the hope of finding common moral ground with other human rights causes. While the U.S.-Mexico border is often described as a battlefront for important issues like immigration, drug policy and crime, Ayotzinapa activists in Mexico and the U.S. say that the border is more like a mirror that reflects a larger human reality. And as activists rally in New York City, the parents of the missing students hope that this larger human connection can help bring their sons, and thousands of other missing people around the world, home.